Jewish Care is Australia’s largest Jewish humanitarian organisation. Our strong history of supporting the vulnerable reflects our values of kindness, compassion and social responsibility. Remembering Jewish Care in your will is a thoughtful act of generosity. It gives you the satisfaction of knowing that you are touching the lives of hundreds of Jewish families and individuals now and into the future. Gifts in wills are set aside and carefully managed so that future generations will benefit for years to come. Have you told us of your intentions to include a gift in your will? By including a gift in your will, you set an important example. Of course, you may wish to keep your intentions private and confidential. However, we hope that you will share your intentions with us so that we can acknowledge your thoughtfulness. [insert percentage – e.g. 50%] to Jewish Care (Victoria) Inc of 619 St Kilda Road Melbourne Victoria for its general purposes and I DECLARE that my Trustees shall not be required to see to the application of the funds and may rely on the written acknowledgement of the Chief Executive Officer, the treasurer / Chief Financial Officer, secretary or public officer for the time being as sufficient discharge." "I bequeath to Jewish Care (Victoria) Inc of 619 St Kilda Road Melbourne Victoria, beneficially and absolutely for its general purposes $[insert] and I declare that my Trustees shall not be required to see to the application of the funds and may rely on the written acknowledgement of the Chief Executive Officer, the treasurer / Chief Financial Officer, secretary or public officer for the time being as sufficient discharge." *NB: residuary estate means the residue, or balance of your estate after payment of any specific gifts, debts, costs and expenses. "I GIVE the residue of my real and personal estate of whatsoever nature and wheresoever situate to my Trustee UPON TRUST and I DIRECT my Trustee to receive payment of all proceeds payable to me and pay such part of my estate as is required to pay my debts, funeral and testamentary expenses and all duties which may be payable by reason of my death or in respect of my estate and I DIRECT that my Trustee pay and apply the balance of my estate to Jewish Care (Victoria) Inc of 619 St Kilda Road Melbourne Victoria for its general purposes and I DECLARE that my Trustees shall not be required to see to the application of the funds and may rely on the written acknowledgement of the Chief Executive Officer, the treasurer / Chief Financial Officer, secretary or public officer for the time being as sufficient discharge." "I bequeath to Jewish Care (Victoria) Inc of 619 St Kilda Road Melbourne Victoria, beneficially and absolutely for its general purposes [insert description of item – e.g. my shares in X; the property located at # Street, Caulfield, Victoria] and I declare that my Trustees shall not be required to see to the application of the funds and may rely on the written acknowledgement of the Chief Executive Officer, the treasurer / Chief Financial Officer, secretary or public officer for the time being as sufficient discharge." 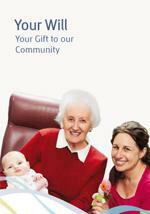 For more information about including a gift to Jewish Care in your will, download the brochure below or contact Feygl Cylich, Planned Giving Manager (03) 8517 5602 or submit an online enquiry. A very valuable document to help you bring all your important and personal information together! Storing important information about your affairs in the one place makes sense. Jewish Care has designed this Personal Records Organiser to help you or your next of kin locate important information as it is needed. When you have completed this Organiser, please take care to store it in a safe place (perhaps also leave a copy with your solicitor and executor/s). Inform at least two people close to you that this document exists and where it is stored.